Osteoporosis is an universal disorder and is commonly seen in the elderly population in India. The definition of osteoporosis, as described by the World Health Organization (WHO) is 'a disease characterized by low bone mass and micro-architectural deterioration of bone tissue, leading to enhanced bone fragility and a consequent increase in fracture risk.' Since the cancellous bone is fragile, vertebral body fracture is very common after trivial injury, which may lead to severe symptoms. Often these fractures may be seen at multiple levels and may need surgical management. Apart from fractures, osteoporosis with spondylolisthesis poses a greater challenge in surgical management due to the higher incidence of implant pullout and failure of instrumentation as a whole. Hence, the diagnosis and medical management of osteoporosis in general, and, that of spinal instrumentation and fusion in particular, need to be understood well by the surgeons. At present, the best parameters to diagnose osteoporosis are BMD (bone mineral density) and DEXA (dual energy X ray absorptiometry). A T score of <2.5 is considered as being diagnostic of the presence of osteoporosis. Administration of anabolic (teriparatide) and antiresorptive (alendronate) drugs for a long period of time improves bone density, promotes bony fusion and prevents screw pullout. Neurosurgeons should give priority to the understanding and learning of the biomechanics of spinal instruments, its metallurgy, designs of pedicle screws, techniques of screw insertion and interbody fusions in the context of the osteoporotic spine. The pedicle is the strongest bone in a vertebra and discovery of the pedicle screw placement technique is perhaps the greatest turning point in the history of modern spinal surgery. However, its usage in osteoporotic bone, although useful, is also extremely challenging due to the poor quality of the cancellous bone in the vertebral body, where the pedicle often fractures during the screw insertion. A pedicle screw should have good pullout strength to accomplish a good stabilization, and hence, there is a continuous process of improvement in the development of new designs, in addition to the usage of various types of bone cement that may facilitate the firm grip of the pedicle screws in the vertebral body. The techniques of screw insertion also has improved further in order to get a good purchase of the bone with the metal. As of now, titanium is the best metal for human application. It has a good metal-bone interface amalgamation, and the titanium rods are flexible and resist fracturing, unlike the surgical grade stainless steel. Various screw designs have evolved over a period of time to address various issues and drawbacks that emerge while operating upon an osteoporotic vertebra, like the more frequent instances of screw pullout [Table 1]. The standard screw has a cylindrical core and a cylindrical thread [Figure 1]. Here, the core provides inner surface and the inner diameter, while the outer border of thread provides the outer diameter of the crew. The distance in between the two threads is called the 'pitch' [Figure 2]. In cortical screws, the pitch is smaller, and in cancellous screws, the pitch is wider. This area between the threads is vital in providing bone purchase, and hence, is an important deciding factor in determining the 'pull-out strength' of the screw. The pull-out strength is assessed by a constant axial force applied to dislodge the screw from a vertebra where it was secured earlier in a laboratory condition. The force utilized to dislodge the screw is called the 'pull-out force'. A good pedicle screw should have a good pull-out strength particularly in an osteoporotic bone. Deeper threads, a larger pitch, and longer screws with a bicortical purchase can improve the pull-out strength of a screw. However, these types of screws are not without limitations when being placed in an osteoporotic vertebral body where a breach of bone may occur during the insertion of the screw. In the dorsal and lumbar regions of the spine, a bicortical purchase of the vertebra is fraught with danger as there is the risk of injuring the ventrally placed large vessels. The length of the screw that is inserted within the body is not very important since the cancellous part of the vertebral body contributes less than 20% in improving the pull-out strength. The pedicle contributes around 60% of the pull-out strength, and in combination with the cortical bone that comprises of the proximal part of the vertebral body near the pedicle, contributes much more to the pull-out strength. Hence, the only way one can improve the pull-out strength, and in turn, achieve a strong fixation is to achieve a bicortical purchase; however, the limitation in achieving a bicortical purchase has already been discussed. Conical screws have a conical core with cylindrical threads, which means that the inner diameter of the screw is progressively larger at the proximal end [Figure 3]. Since the threads are cylindrical all along the screw, the area of bone purchase is larger and there will be constant compression of cancellous bone around the screw distally that improves the pull-out strength. Hence, this design is popular and relied upon. Moreover, the screw insertion in the case of a conical screw is easier compared to the standard one. Attempting further improvement in these screws by adding self-tapping ridges to avoid tapping as a separate step of the pedicle screw insertion procedure did not practically improve the pull-out strength of these screws [Figure 4]. Recently, double threaded conical screws have been introduced that aim to provide appropriate threads at the pedicle (containing the cortical bone) and the body (containing the cancellous bone) [Figure 5]. Inspite of these modifications in the vertebral screw technology, there are still less-than-satisfactory outcomes in the presence of osteoporosis due to the destruction of the bony architecture of the vertebral body. To obviate this and to enhance the screw purchase strength, different varieties of bone cement have been introduced at the distal end of screw through a cannulated screw design. These cannulated conical screws have pores at the distal end between threads through which a fast setting cement can be injected into the osteoporotic cancellous bone which can grip the screw and hold it in place, and hence, can increase the pull-out strength of the screws [Figure 6]. This system is gaining popularity in the recent times and is used both in the open and percutaneous forms of spinal fixation. PMMA (polymethyl methacrylate) is the preferred bone cement due to its fast-setting feature and its time-tested screw holding property, when injected into the holes created in the vertebral pedicles and body. It produces heat and can cause severe hypotension and embolism that can lead to morbidity. Nevertheless, it is still preferred over calcium phosphate, which despite being biodegradable and less toxic, has a weaker screw holding property. Hydroxyapatite produces a very good screw bone contact by osteointegration and is now used in coating the outer surface of the conical screws [Figure 7]. Expandable screws are the latest advances in the spectrum of pedicles crews and have tested well in the laboratory setting with a good pull-out strength [Figure 8]. These expandable screws come with either four fins or two fins. There is a differing opinion regarding their usefulness in an osteoporotic spine, since the distal expansion of the screw following its insertion also causes destruction of the thin trabeculae of the osteoporotic vertebra. Hence, it is inferior to the cancellous conical screw that is fixed with a cement scaffolding around itself. However, one inevitable fact that emerges from this discussion is that in situ ations where removal of screws may be needed, the cemented screw may be more difficult to remove than the finned expandable screws. Insertion of a pedicle screw is perfect when the following steps are undertaken: A proper selection of the screw entry point, a corticectomy, a pilot hole preparation (probing), maintaining a proper direction of screw insertion (known as the insertion angle), tapping, a proper selection of the screw to be inserted, an appropriate insertion torque, ensuring screw turn back and ascertaining a proper final screw position. There is significant difference observed in the feeling one gets, while inserting a screw in a normal vertebra and that obtained in an osteoporotic vertebra. Extreme caution should be exercised by the surgeon in not damaging the fragile track within the osteoporotic bone, since once the pedicle is damaged, it is rendered useless for reinsertion of the screw and the whole procedure become a problem after that complication. Though various screw entry points have been described by Roy Camille, Arthur Steffee, Weinstein and many more, the point where the ridges of superior articular facet, pars interarticularis and the transverse process meet is the strongest point, also called as the 'force nucleus.' It is the ideal entry point for all vertebrae of the lumbar spine. At the sacrum, however, a point at the inferior half of superior articular facet and just lateral to it, is the ideal entry point, as described by Steffee. This entry point ensures a long trajectory of the screw through the pedicle. Roy Camille advocated the double screw entry into the pedicle using a domino system nearly three decades ago. Weinstein preferred a point inferior and lateral to the Steffee point and directed a screw angled towards the superior and medial direction, which also ensures a longer screw trajectory [Figure 9]. The pilot holes inserted into the pedicles to determine the trajectory of the screws need to be small so that they do not inadvertently perforate the cortex; and, since resistance is so low in the thin trabecular bone, the tap making the pilot holes should be advanced meticulously without force. The probes are designed to be conical to avoid a sudden cortical breech (resulting in a sudden give–way feeling) while probing the body through the pedicle [Figure 10]. The direction of pilot hole determines the direction of screw insertion, and hence, it has to be planned well. Screws directed in a straight course into the vertebrae have a better pullout strength than those placed in the anatomical direction of the pedicles. Screws directed in an oblique supero-medial direction are considered to be having a greater pull-out strength. However, studies related to the direction of screw insertion in osteoporotic bones have not shown the oblique supero-medial direction to be superior to the straight one. Screws directed 30 degrees medially from the entry point through the pedicle into the vertebral body have shown a superior pull-out strength in the normal bones. In osteoporotic bones, therefore, screws can be placed straight and should be as long as possible so that their tip stops just short of the distal cortex. Tapping of pilot holes is done with a tap 1 mm less than the size of the selected screw. A 5.5mm tap is recommended in the osteoporotic vertebrae for a 6.5mm screw due to the good pullout strength of the wider screw. Tapping of the pedicle up to the proximal part of the vertebral body is sufficient in the presence of osteoporosis as this step can prevent fracturing of the very thin trabeculae. An ideal screw with a larger diameter (6 to 6.5mm) is selected and is inserted with adequate force (also known as the insertional torque), along the same track and in the same direction as the pilot hole until it is well secured. Hubbing of the head of the screw over the entry point was considered as an essential maneuver in order to achieve an excellent purchase; however, a detailed study proved this maneuver to be of no value. In fact, this may damage the cortical bone and can cause shear stress over the cancellous bone during the over-enthusiastic tightening of the screw, thus promoting loosening of the purchase and a higher screw pull out rate. A screw turn back may be needed in times to readjust the screw. This, however, may result in damage to the bony trabeculae and hence should be done carefully. Injection of cement to augment the screw purchase in an osteoporotic spine is gaining popularity due to its proven efficacy. This especially holds true with PMMA that may be inserted along the screw track using cannulated screws. 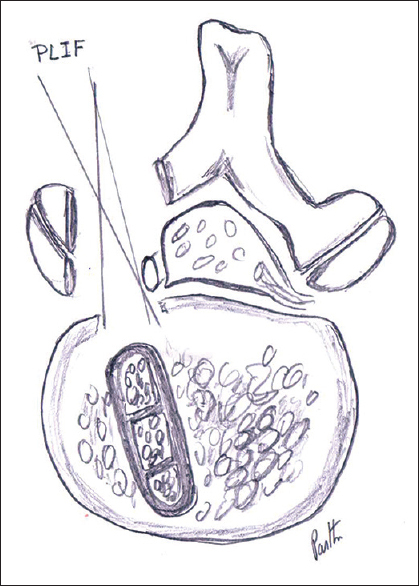 In this technique, the screws are placed first and the cement injected later through the cannulated lumen within the body of the screw. However, screws inserted following cement injection through pilot holes have proven to be more efficacious in laboratory tests. This is an interesting topic for future discussion and debate. Coupling bilateral screws with crossbars does prevent pullout by securing the screws. This technique need to be validated. However, transverse connectors on rods seem to have a better effect in preventing axial rotation of the spine, thus preventing the screw pull-out. Double bars are more effective when placed at the middle and upper part of the rods. This trajectory does not enter the center of the vertebral body. Instead, it starts from a point over the lamina at the junction of inferior border of the transverse process and lamina, passes through the inferior and medial corner of the proximal pedicle, then through the pedicle and towards the supero-lateral corner of pedicle, and pierces the superolateral endplate of the vertebra, thus keeping the screw in cortical contact all the way from an inferomedial to a superolateral angle [Figure 11]. This technique is not widely carried out, though in principle, it sounds good, except for the fact that the screws are not convergent to the spinal axis but rather divergent. This is actually ideal for osteoporotic spines where the cortical bones are relatively well preserved., A bicortical screw purchase has a better pullout strength than a unicortical screw purchase inspite of the trancancellous route of the latter. Many a times, we have appreciated that an angled suboptimal screw placement that was taking purchase of the inner cortex of the pedicle, and which needed a much greater insertional torque, finally emerged looking a much stronger construct, although it appeared as an unconventional screw placement on radiographic images. The screw trajectory proposed by Weinstein is oblique from the lateral to the medial direction, and from the inferior to the superior aspect, and requires a high insertional torque. All these trajectories are basically cortical bone trajectories. Insertion of two screws (of a smaller diameter) in a pedicle was practiced by Roy Camille using a domino system on plates, many decades ago. The smaller diameter screws can be directed at different angles in the pedicle, and the head of the screws is held by two grooves in a domino fashion. This was an excellent technique that never became popular in our country since it was not commercially available. Since cortical bones are relatively spared in the presence of osteoporosis, and the laminae and facets are relatively stronger, sublaminar wiring and facet hooks are additional adjuncts that provide strength to the standard pedicle screw fixation. In fact, these techniques have been available much before the pedicle screw fixation technique was introduced into routine clinical practice. This is particularly true in the case of sublaminar wiring and rectangle rod fixations. The technique of lumbar interbody fusion is the 'gold standard' technique when compared with the posterolateral fusion technique due to the high fusion rate achieved in the former. The vertebral surface area available for the bone grafting is large. The bone grafts occupy the anterior column and anterior half of the middle column in the lumbar spine. These areas are essential for weight bearing and load sharing. Though posterolateral fusion is easy to perform, fusion rates are relatively lower. The latter procedure does not prevent kyphosis in the absence of instrumentation since the bone grafts are applied over the spinous processes and the facet joints that are not providing an articular surface with a compression force. 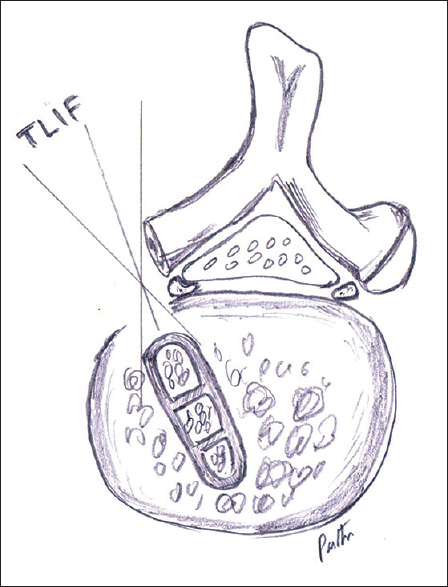 The PLIF (posterior lumbar interbody fusion) technique has been in practice for more than three decades and has been quite popular until recently, when many surgeons shifted to the TLIF (transforaminal lumbar interbody fusion) technique. The fusion rates may not be different in the two procedures but definitely TLIF is easier to perform and can be done with the minimal access technique also [Table 2]. PLIF is performed through the conventional posterior midline approach [Figure 12]. Partial laminotomy of the adjacent laminae and a medial facetectomy accesses the lateral aspect of the spinal canal, exposing the descending nerve root crossing the annulus of disc of the immediately inferior intervertebral disc space. The nerve root needs to be retracted to expose the disc. A wide annulotomy, discectomy, complete intradiscal removal of disc material, scrapping of the adjacent cartilaginous end plates, perforation of the end plates and then packing the disc space with abundant cortico-cancellous bone grafts along with tricortical iliac crest grafts or cages made up of titanium or polyethylene ethylene ketone, are the essential operative steps. The aim is to fill the maximum area of the disc space with bone grafts. While cages provide structural support, bone grafts provide osteogenic and osteoconductive properties to the site. 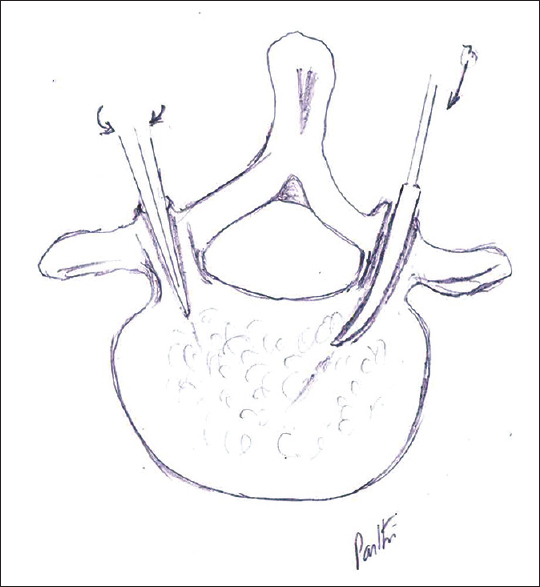 Since PLIF is done medial to the facets, the access corridor is narrow and there is restricted space for an angulated trajectory to the disc space and for movements of long instruments like curettes towards the midline. The cages have to be placed straight into the disc space and the tricortical grafts need to be mobilized medially. All these procedures need to be done while continuously monitoring the retracted nerve root medially. PLIF is relatively easier at the L5/S1 level than at the L4/5 level and above, and hence, may result in a higher rate of foot drop reported or noticed in clinical practice. This is one of the reasons why many surgeons have sought an alternative approach to carry out the lumbar interbody fusion. 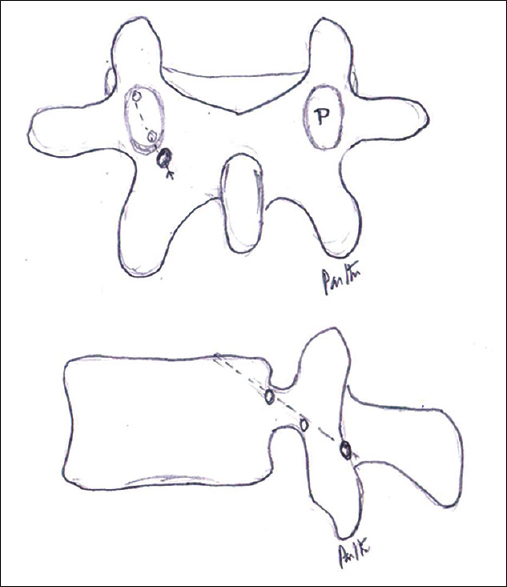 Transforaminal lumbar interbody fusion (TLIF) can be done through the conventional posterior midline approach, the paramedian approach (Wiltse's approach) and the paramedian minimal access approach [Figure 13]. The paramedian approach is performed through the facial planes of muscles and muscle split techniques and the surgeons practicing this approach claim to have better outcome with this approach. In this approach, the pedicle entry points, the pars interarticularis and the facet joints that are present in line are exposed with minimal muscle dissection. Which ever approach is chosen, the key surgical step is to remove the articular processes of the facet joints in totality along with the lower half of pars interarticularis of the superior vertebra and adjacent lamina as required. This exposes the foraminal and extraforaminal annulus fibrosis of the disc lateral to the descending nerve root. Thus, a wide area is available to perform the interbody fusion. The fusion techniques are the same as done during the PLIF technique. Since the annulotomy is lateral to the nerve root, it is easy to maneuver long instruments and the cages can be inserted obliquely. Since the need for retraction of the nerve root is obviated, postoperative neurological deficit is rare [Figure 14]a,[Figure 14]b,[Figure 14]c,[Figure 14]d,[Figure 14]e,[Figure 14]f,[Figure 14]g,[Figure 14]h,[Figure 14]i,[Figure 14]j,[Figure 14]k,[Figure 14]l,[Figure 14]m.
In the presence of osteoporosis, since cancellous and cortical bones are relatively thin, all intra-discal procedures should be done meticulously while being careful about only applying an optimum force, failing which fracture and breach of end plates can be easily be produced, which may lead to graft and cage subsidence and collapse of the disc space., It is a good surgical practice to pack the intervertebral space with autologous bone grafts along with TCP (tricalcium phosphate) and HA (hydroxyl apatite) granules for promoting bone fusion rate. Cages alone may not be adequate for achieving an adequate interbody fusion. The right selection of screws and a meticulous surgical technique will ensure a good outcome in osteoporotic spinal disorders. Conical and cannulated screws filled with cement are the ideal screws available at present. The technique of attaining a bicortical purchase and an optimum cortical bone trajectory needs to be mastered. 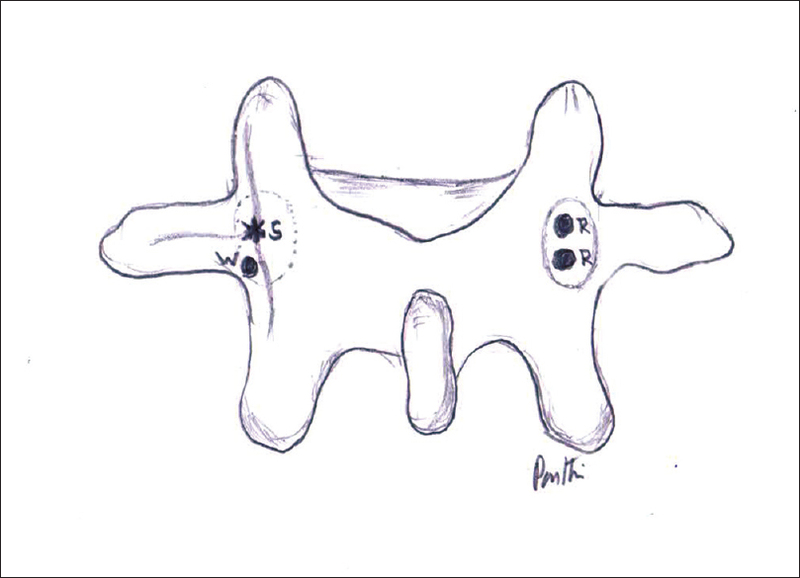 Transforaminal lumbar interbody fusion is easy to perform and achieves an excellent interbody fusion. Medical management with anabolic steroids and antiresorptive medications should be a part of the pre- and postoperative management in all patients with an osteoporotic spine undergoing bony fusion. Gupta SK, Singh R. Spinal surgery in patients with significant osteoporosis: The therapeutic advances and research perspectives. Neurol India 2017;65:96-8. Shea TM, Laun J, Gonzalez-Blohm SA, Doulgeris JJ, Lee WE, Aghayev K, et al. Designs and techniques that improve the pullout strength of pedicle screws in osteoporotic vertebrae: Current status. BioMed Research Int 2014;2014:748393. doi: 10.1155/2014/748393. Dai F, Liu Y, Zhang F, Sun D, Luo F, Zhang Z, Xu J, et al. Surgical treatment of the osteoporotic spine with bone cement-injectable screw fixation: Technical description and preliminary application in 43 patients. Clinics (Sao Paulo) 2015;70:114-9. Donnellan CJ, Ball J, Rao PJ, Phan K, Mobb RJ. The cortical bone trajectory: An alternative to traditional pedicle screw fixation. JSM Neurosurg Spine 2016;4:1061. Cho W, Cho SK, Wu C. The biomechanics of pedicle screw-based instrumentation. J Bone Joint Surg (Br) 2010;92-B:1061-5. Vemula VRC, Prasad BC, Jagadeesh MA, Vuttarkar J, Akula SK. Minimally invasive transforaminal lumbar interbody fusion using bone cement-augmented pedicle screws for lumbar spondylolisthesis in patients with osteoporosis. Case series and review of literature. Neurol India 2018;66:118-25. 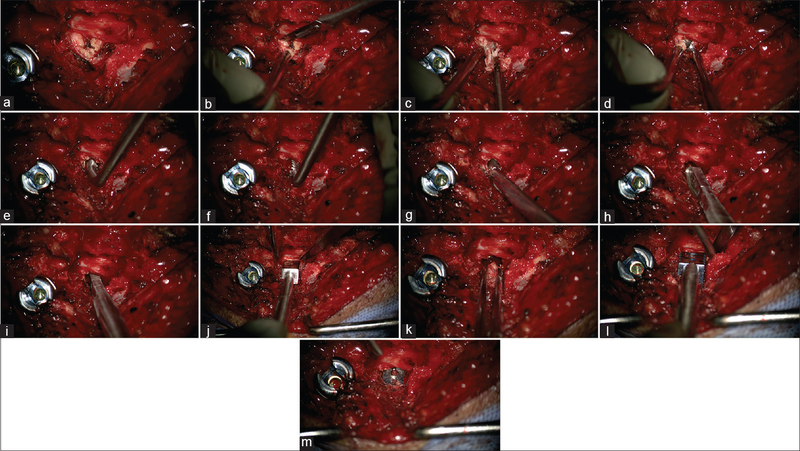 Jayachandar V, Sanjeev A, Kumar SA, Kumar R. Segmental polymethylmethacrylate-augmented fenestrated pedicle screw fixation for lumbar spondylolisthesis in patients with osteoporosis–A case series and review of literature. Neurol India 2016;65:89-95.